Cyclades is from the duo game designers Bruno Cathala and Ludovic Maublanc (Mr. Jack and DiceTown) and is part of Matagot’s XL Collection. Set sail for the Cyclades in the heart of Ancient Greece. With the blessing of the gods of Olympus, and support of fabulous mythological creatures, recruit troops, build ships, erect fortresses and ports, build Metropolises. The struggle to shine your city will be terrible! 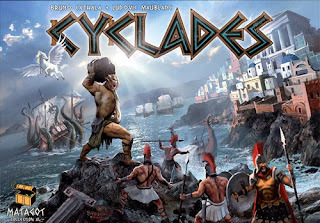 Cyclades is a strategy game where players strive to control two Metropolises in order to win. The game board represents the Islands that make up the Cyclades archipelago. On each turn players will bid for the right to use one of five available Greek Gods. Each God grants their own special power including the right to summon Mythical creatures to help the controlling player. During the action phase, players will be able to recruit fleets, troops, priests, and philosophers. They will also be able to build buildings of various types. Buildings and philosophers are used to develop Metropolises that are necessary to win. Fleets and troops are used not only for defenses but to attack and conquer an opponent’s holdings including their Metropolis. Why build, when you may find it easier to attack and conquer. Priests give players the ability to manage their gold better during the auction phase. The player who bids well, manages their gold, and uses the Gods and Creatures best will control two Metropolises and gain victory as the supreme leader of the Cyclades.